Many hospitals and health systems are working hard to create a positive clinical experience for patients—offering proactive service estimates, improving bedside manner, and providing online patient resources to name just a few. We’ve even heard of patients being greeted by crews of coordinated staff members like they’re shopping at the Gap. In fact, it’s common practice for patients to be polled after a procedure about the warmth, friendliness and communication skills of the hospital staff. The logic is, if patients are happy with the medical service, they’ll be likely to pay the medical bills. And then they’ll leave nice reviews online, too. Perhaps if patients paid their balances in full before they left the hospital that would be the predominant case. Patients would have a great first and last impression of their provider before moving on. But in healthcare, the last touchpoint happens weeks after service when the patient receives their medical bills. And if those bills are much higher than expected, confusing to understand, and inconvenient to pay (which they so often are), the warm and fuzzy feeling from great care will be entirely forgotten. The financial impact of a bad last impression from billing cannot be overstated. 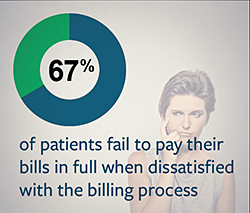 In terms of direct losses, 67% of patients fail to pay their bills in full when frustrated with the billing process.1 The revenue lost from collection fees and write-offs is a major driver of the industry-wide rise of bad debt. And the indirect costs are potentially greater. People are 52% more likely to leave bad reviews than good reviews on sites like Vitals, Healthgrades, RateMD and Yelp.2 Those negative online reviews are powerful. Search engines like Google prioritize user-generated content, bringing patient complaints to the front of a hospital’s web presence. As 77% of patients consult online reviews before selecting a doctor3 and 70% of those patients trust online reviews4—billing complaints can drive thousands of patients to the competition. Billing is the last touchpoint with patients. Allowing it to be a negative experience can do serious damage to the bottom line. But this doesn’t have to be bad news. A positive financial experience has the opposite effect—securing patient loyalty and influencing more patients to pay their bills in full and on time. Every health system and hospital has the power to make last impressions that drive revenue. 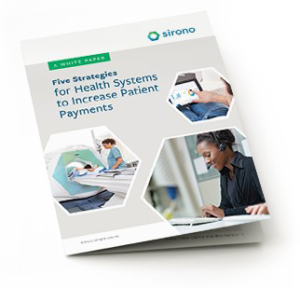 If you’d like to see how, read our whitepaper, Five Strategies for Health Systems to Increase Patient Payments.